It’s well past the Summer Solstice and I’m only just posting about Beltane. Boy, have I got some catching up to do! Let’s begin. A long time ago I drew my first ley line along a map of North Wales. 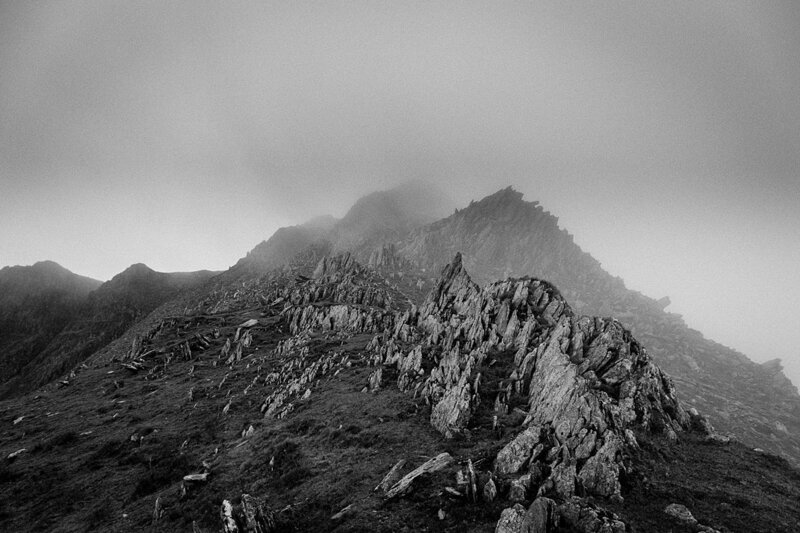 One of its key points in Snowdonia was the peak of Yr Elen. Something had been drawing me to the place ever since that moment, but I had never had the strength of will to meet the challenge. Now, I needed to prove to myself that I had such determination in the face of all that was contrary such as common sense, time, distance, effort, capability, weather. Also, I was on the quest of “Fresh start – New Ground”. 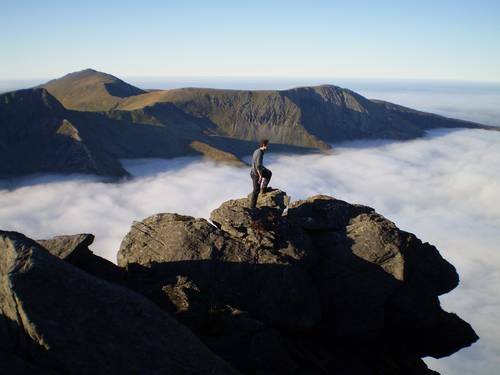 The Carneddau range of peaks had been a long-time goal and I wanted to be prepared to meet the challenge if I was to make anything of this year. I drove for a couple of hours early in the morning to arrive before most other people had arrived. Parking just beyond Llyn Ogwen I began the ascent with a backpack which contained clothing for all eventualities. There were clouds and breaks in the sky but the day could bring anything. I was ready for it. The ascent was steeper than I imagined. There were several parts where it was a scramble and an actual foot and hand-hold climb. With a large backpack on that was quite scary, and I soon began to become worried about whether I would be able to make the descent again if I was much more tired towards the end of the day. There was mist on the top of the ridge. So, there was no view at all. I had climbed for an hour and a half almost vertically and my reward was a piercing cold, damp mist, no view and a howling wind which tore over the top of the ridge pushing my close to the edge with every step. Nice. Why was I doing this again? Oh yes – I thought it would be fun. I tightrope-walked along the narrow ridge, occasionally stopping to wait for mist to clear so that I could discern the path. 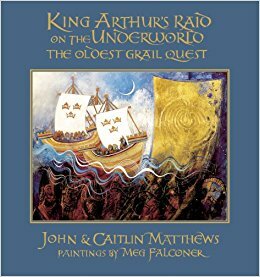 The journey across from Caer Dafydd to Caer Llewellyn reminded me of Arthur’s voyage through the seven Caers, as explained in detail in the book “King Arthur’s Raid on the Underworld” by John Matthews. Atop Caer Llewellyn I could feel that Yr Elen was not far away. The peak that I sought a quarter of a mile away, but it would be in the wrong direction, and would involve a steep descent and re-ascent as I walked there and back. Was it worth it, I wondered? I felt the damp and cold so strongly that I couldn’t face going to Yr Elen. It was only two or three degrees on top of Caer Llewellyn even though this was Spring. Despite me wanting to reach my destination I felt that Elen had defeated me today! I hunkered down to drink some warming coffee and eat some needed sustenance. Happily, I was joined by four lovely Polish walkers who waxed lyrical about the hills of their homeland. Today I didn’t feel I could return the enthusiasm. I took the long way down, hoping it would be easier. Initially it was. The ridge circled around the lake which lay amid the sharp ridge line. Then, just as confidence was returning the way got hairy at the mid point! Finally I was down walking aside the lake, and into the sunshine. For the first time in hours I began to warm up. Possibly too much! 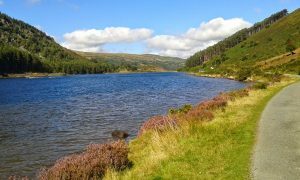 I had only a long hot walk alongside Tryffan and Llyn Ogwn to get back to the car park with which to console myself about the experience. Never again, I decided. This had been a test of monumental proportions and I had been unable to meet it. Not what I had expected this Beltane. It seems I completely missed the spirituality of the moment and instead I got caught up in a physical confrontation with Nature herself. Reconciled with this, I began the drive home. With each mile I became more at one with the experience. I felt that perhaps this was not the experience I was intended to have this day. Then, what WAS the experience I should have? At that moment I spotted a sign for Llyn Geirionydd – the beautiful lake that has associations with the bard Taliesin. This was too coincidental, and I turned suddenly, directed by fate. Whilst there I was able to meditate and reconcile myself totally with the experience. I had missed Elen because I had followed my will and my will was neither aligned with the day, nor with any real purpose other than some machismo need to conquer. Elen had totally blocked me from achieving that, and now I was back on track. I asked where I should go to find the true purpose of the day. I got my answer straight away – to the Llangernyw Yew tree. This, I believe, is a message to me to to preserve that feeling of being in spiritual contact with Nature. This day was about facing adversity. The coming quest is to acknowledge defeat, but continuing to fight for what you believe in.